George passed away peacefully at the Glebe Centre on Monday, July 16, 2018, in his 102nd year. Predeceased by his wife Evelyn. Cherished father of Deborah, Ellery (Ruth) and Wendy (David McCutcheon). Grandfather to Kimberly (Juan Medrano), Kristilyn (Steve Earl) and Marenda and great-grandfather to Tenley. George will be remembered as a gentleman; kind, generous and very connected to family. He and his three brothers grew up on a dairy farm in Osgoode, Ontario. He attended high school in Kars and Willis College business studies in Ottawa. In 1942 he enlisted in the army and became an Ammunitions Inspector for WWII. His service took him to France, Belgium, Germany and Holland. After the war he worked for 25 years as an Auditor for the Federal Government. At the time of passing, he was one of the eldest veterans from WWII. George was also the eldest living descendant – a great-great-grand –nephew of the Ottawa founder Nicholas Sparks. He was one of the first volunteer drivers for the “Meals on Wheels” which his wife Evelyn started 50 years ago. George loved to dance and instructed Ball room Dancing, Line and Square Dancing. He and his wife loved to travel to many places around the world. 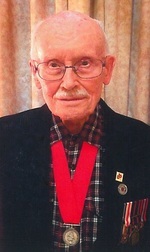 In Nov. 2015 he was invested into the Order of St. George as a Field Knight and a couple of years later was honoured by Willis College by naming the Veteran Friendly Transition Program Learning Centre after him. The family thanks the dedicated staff of the Glebe Centre for their excellent care of George during his stay with them. We also wish to thank the nurses of St Elizabeth Health Care for their expert home care service. Friends are invited to St. John the Evangelist Church (at the corner of Elgin and Somerset), on Monday, July 23, 2018, 12:30 for visitation, the service at 1:30pm, followed by a reception. In lieu of flowers, donations may be made to the Glebe Centre Arts Program.